The GOCE (Gravity field and steady-state Ocean Circulation Explorer) satellite was the first core mission of ESA's Earth Explorer programme (Drinkwater et al., 2003) and has been launched on March 17, 2009 from Plesetzk, Russia. The official end of the mission was declared on October 21, 2013 when the satellite ran out of fuel and the drag-free flight could no longer be realized. Three weeks later on November 11, 2013 the satellite re-entered the Earth´s atmosphere. Figure 1 shows the orbit height of the satellite from October 17 to November 10, 2013. GPS measurements have been available until a few hours before the re-entry of the satellite and enabled precise orbit determination (POD) down to about 140 km altitude (Jäggi et al., 2014). The Astronomical Institute of the University of Bern (AIUB) is member of the European GOCE Gravity Consortium (EGG-C), which was responsible for the GOCE Level 1b data processing and Level 2 product generation. This work was integrated in the GOCE High-level Processing Facility (HPF). AIUB performed POD based on GPS measurements provided by an on-board 12-channel Lagrange receiver. The resulting Precise Science Orbit (PSO) consists of two different orbit types, a reduced-dynamic and a kinematic orbit. The procedure for generating the PSO was running automatically from October 31, 2009 until November 11, 2013 with a latency of 7-10 days. GOCE orbit results for the entire mission were presented by Bock et al. (2014). The PSO products were validated by independent Satellite Laser Ranging (SLR) measurements. 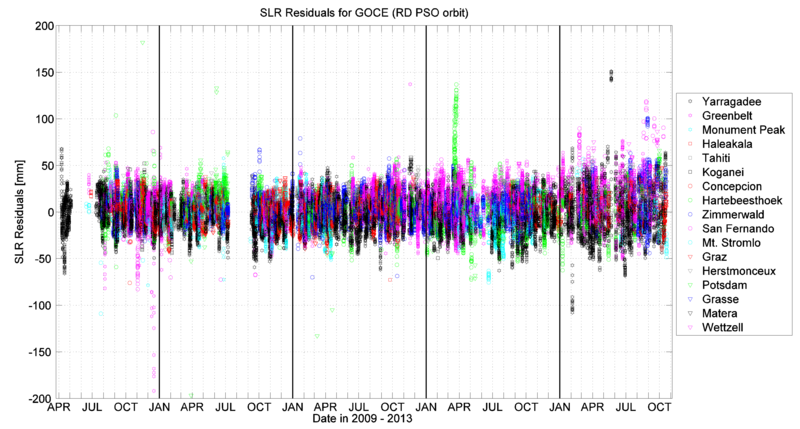 Figure 2 shows SLR residuals (mean: 0.18 cm, RMS: 1.84 cm) for the reduced-dynamic GOCE orbits for the time period from April 10, 2009 to October 21, 2013. The independent validation of the GPS-derived orbit results by the SLR tracking of the satellite was very helpful to achieve such a remarkable orbit quality. 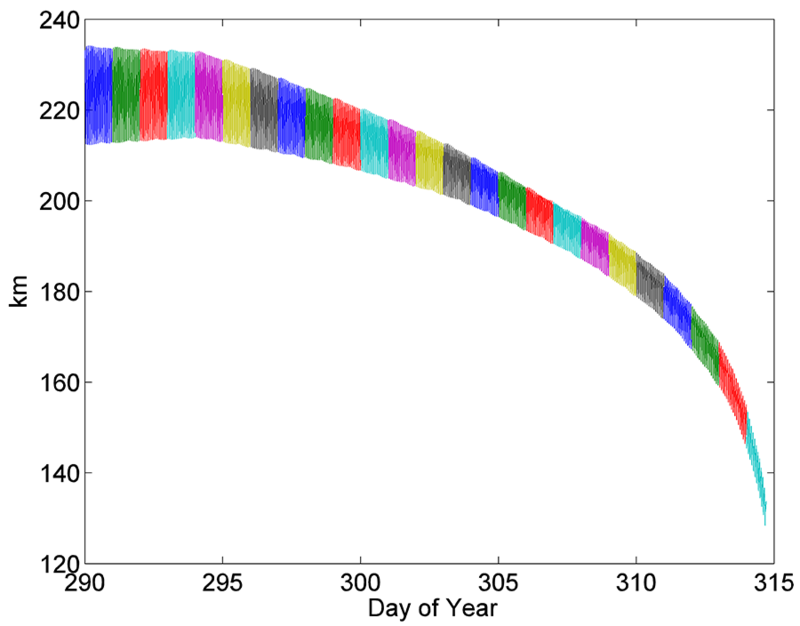 SLR validation for reduced-dynamic orbit from April 10, 2009 to October 21, 2013. Bock, H., Jäggi, A., Beutler, G., Meyer, U. (2014). GOCE: Precise orbit determination for the entire mission. J Geod, 88(11):1047-1060, doi 10.1007/s00190-014-0742-8. Jäggi, A., Bock, H., Meyer, U. (2014). GOCE Precise Orbit Determination for the entire mission – Challenges in the Final Mission Phase. In Proceedings of the 5th International GOCE User Workshop, Paris, France, November 25 - 28, 2014, ESA Publication SP-728. Drinkwater, M.R., Floberghagen, R., Haagmans, R., Muzi, D., Popescu, A.(2003). GOCE: ESA's first Earth Explorer core mission, Space Science Reviews, 108(1-2), 419-432,doi:10.1023/A:1026104216284.